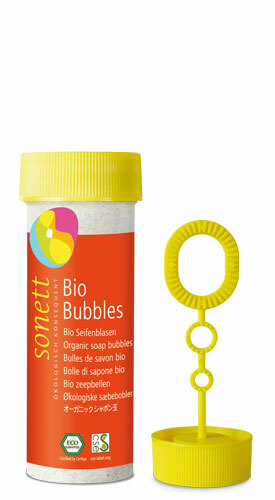 The first soap bubbles from raw materials in organic quality. The small container is made of polywood – a polyethylene with finely ground wood fibers, thus saving more than 20% crude oil. A toy for kids and adults to have fun with outdoors. The soap bubbles can be blown through rings of three different sizes and have been tested in accordance with CE safety standards. Application: Simply dip in and blow through rings of three different sizes.